Just as many of the locals here are, the security personnel involved in rescue and relief operations have also been compelled to take shelter under the open sky, as most of the police posts have either collapsed or been rendered uninhabitable. Moreover, the buildings have suffered significant damage on account of the locals’ vandalising them because they were angered by the delay in relief and rescue efforts. Locals in Barahbise, for example, damaged a police patrol van, leaving the police with no vehicles. The lack of proper operations bases has many policemen worried. Likewise, because the Barahbise Police Post has turned into a heap of rubble, and without there being even a tent at the premises, most police personnel sleep in public vehicles parked on the roads. Some policemen have lost their lives as well. 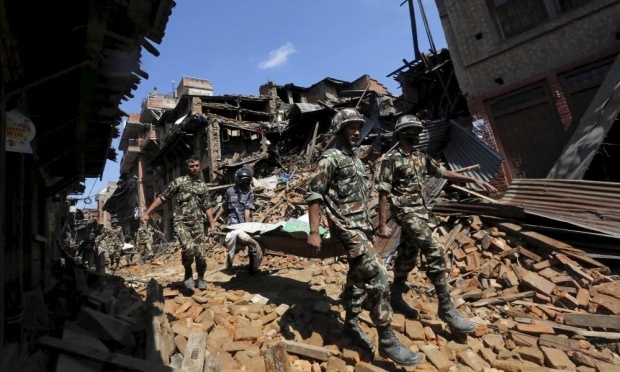 In Larcha, a police constable stationed at the border police post succumbed to injuries he sustained during the Great Quake, because he hadn’t been treated even eight hours after the tremors hit. According to his colleagues, his life could have been saved had he been rescued in time. All in all, 23 permanent and temporary police posts all over the district have suffered damage. They include posts in Tipeni, Manekharka, Melamchi, Thokarpa, Bhotechaur, Nawalpur, Barahbise, Larcha, Pisker, Thulopakhar, Jalbire, Balefi, Lamosanghu, among others. The police have also not been able to procure separate tents for female security personnel. Speaking under the condition of anonymity, one police personnel said that the policewomen’s condition was beyond miserable.